In recent weeks, we’ve encountered a couple of really great burgers on Bath street, namely the house special burger from Moskito and the Fat Pig burger from Palomino. 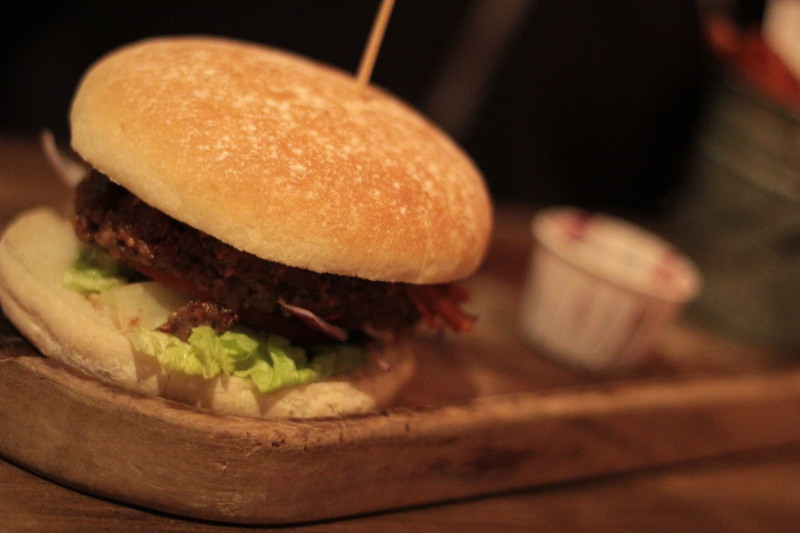 Since we’re coming up on our first birthday here at James vs. Burger, we’ve been feeling all nostalgic recently and decided to head back to Bath street to make a return visit to Slouch, one of the first bars we reviewed a burger in. Inside, Slouch is a pretty great venue. Split into two sections, there is a noisy bar area if you’re in for drinks and a quieter dining area, if that’s more your thing. Don’t worry, there are also tables at the bar area, should you wish to munch on your burger whilst listening to some fantastic music, which is always pretty much guaranteed at Slouch. After browsing the fairly large menu which is packed full of everything from burgers and pizzas to steak and pasta dishes, we went for the ‘Sweet Child O’Swine’ burger and the ‘Rebel Yell’ burger. Neither of these were available on the menu when we visited nearly a year ago, so we thought we’d try something new. The sweet child o’swine consists of a beef patty topped with pulled pork and barbecue sauce and the Rebell Yell is made up of a beef patty topped with bourbon & bacon marmalade and mature cheddar. Both burgers also came with lettuce, tomato and red onion and were served on a toasted bun with twice cooked chunky fries. Both cost £7.95. We were well aware from our previous visit that Slouch’s burgers had been served on the same floured bun that we here at JVB have now come to refer to as ‘the floured bun of doom’. Previously, that had been our only criticism of the food and we had been hoping that, a year later, they would have replaced it with something else. Unfortunately, a change was not to be and each patty was sandwiched between the same dreaded, floured bun that we’ve come to hate. As a result, neither burger was much to look at, but what about taste? 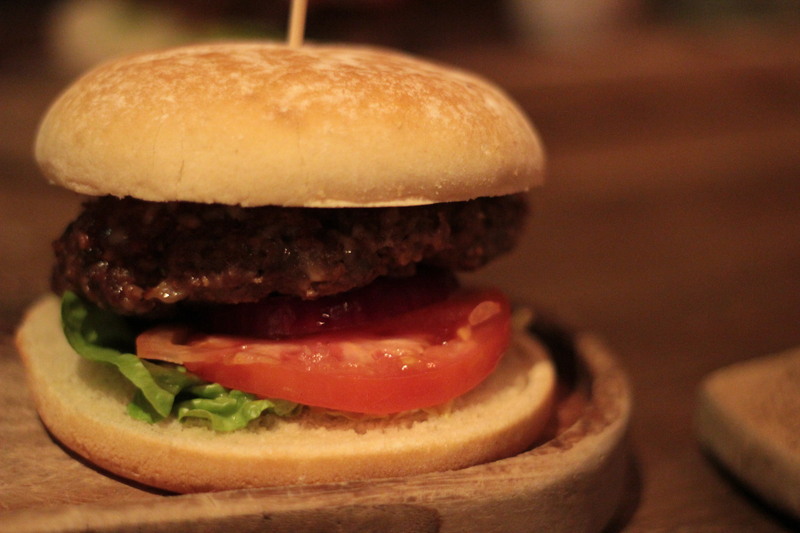 Despite a lacklustre bun, the rest of the burgers were pretty damn good. Each patty was juicy and had a nice, peppery seasoning. As soon as we took a bite of the patty, we were almost immediately craving some peppercorn sauce to pour over the top of it. It was a nice, intense burst of flavour that almost made up for the fact that after a couple of bites, the floured bun was already beginning to come apart. 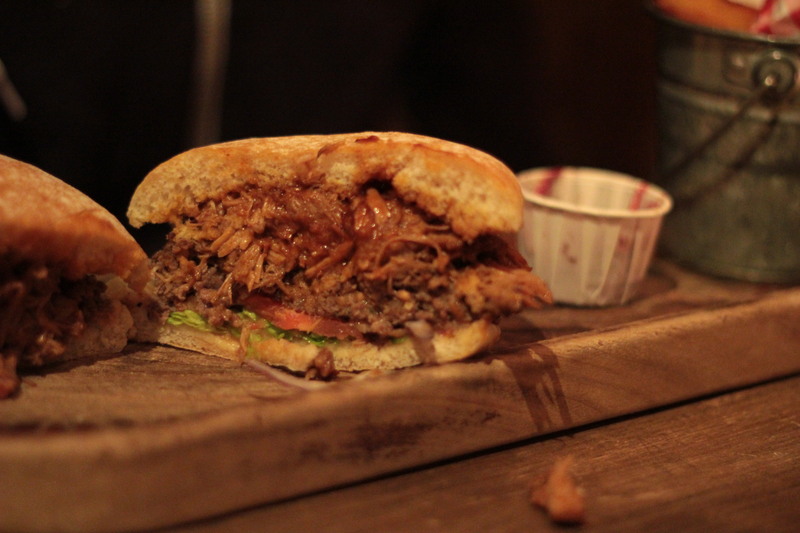 Despite a poor bun, the pulled pork burger was pretty great! The pulled pork on the Sweet Child O’Swine burger was absolutely delicious. We should be absolutely sick of pulled pork at this point in time since just about every restaurant in the city seems to stock it these days; however, when it’s this good, we’re still more than happy to eat it. And this pork was very good. It was loaded with barbecue sauce and combined with the already peppery patty, it was like receiving one giant roundhouse kick full of flavour straight to the mouth. As for the Rebel Yell burger, the bourbon & bacon marmalade that it came served with was very good, the highlight of the burger in fact – I just wish there had been a lot more of it. It had a lovely smokey taste and a sticky, almost treacle like texture that makes you sit up and take notice whenever you get a taste of it; however, as there wasn’t a lot of it, the flavour was slightly lost underneath the strong mature cheddar and the bold flavours of the meat. We’d still have preferred the patties to have been cooked medium, but this is something that not many places in Glasgow seem to offer. We’ve asked for it a few times and while some bars and restaurants are only more than happy to oblige, some simply don’t offer this as an option. We didn’t ask for it in Slouch, so we’re unable to comment on whether it would have been an option or not. We wish that there had been more bacon bourbon marmalade on the Rebel Yell burger. It was all kinds of tasty. Each burger was served with twice-cooked fries and slaw. The fries here are absolutely fantastic and we can’t recommend them highly enough. 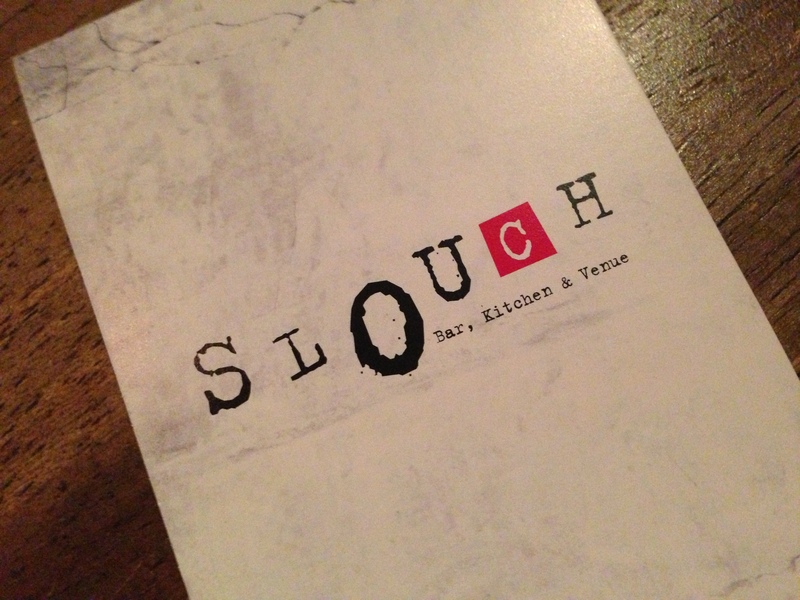 Overall, Slouch appears to be consistent in serving up good burgers and we like the fact that guys there are still coming up with new ideas and adding new burgers to the menu, despite the fact that it’s clearly a popular venue. During our short visit alone, the amount of burgers we saw coming out of the kitchen reached well into double digits. The burgers here are good, but certainly not perfect. The bun is something we just can’t get past and continue to be confused as to why so many bars and restaurants in the city continue to use the same one. Yes, it can seem like, at times we are the brioche bun’s number one fans, but aside from frozen seeded buns from the local supermarket, we’d rather that our burgers came in just about anything else besides these. 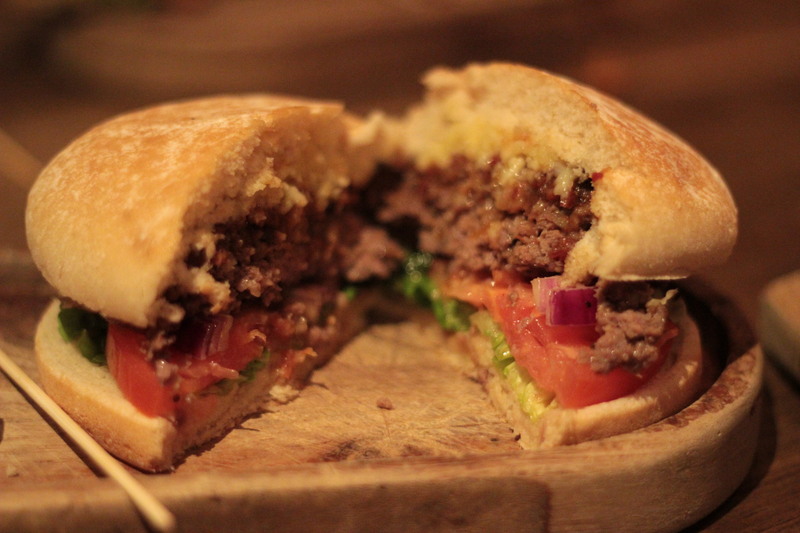 The floured buns are overly stodgy, flat and not good at holding the contents of a burger together at all. A different bun would have not only boosted the presentation of the food, but added a whole new dimension to the flavour. + Nice patty with big, bold flavours. + Pulled pork was delicious. + Bacon bourbon jam was very addictive and unique. – Presentation of the burger was a little flat, but this was mainly due to the dead bun. That pulled pork does look really good. 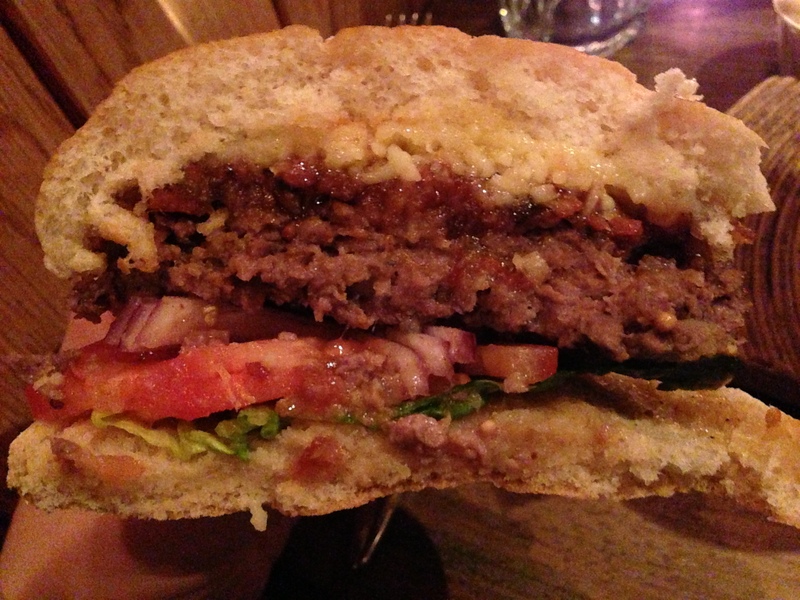 I’ve been to Slouch a couple of times and had a burger both times, and was actually a bit disappointed. It was, in part, due to the boring, dry bun but I also just found the patty to be overcooked and, while the menu had a great selection, it was really just different combinations of toppings. There was nothing *wrong* with it per se, I was just never blown away. that I actually would want to…HaHa). You definitely put a fresh spin on a topic that’s been written about for many years. clever work and exposure! Keep up the superb works guys I’ve included you guys to blogroll. of writing is in fact fruitful designed for me, keep up posting these articles or reviews. to go ahead and give you a shout out from Houston Texas! Just wanted to mention keep up the good job! It’s in point of fact a nice and useful piece of information. I am satisfied that you shared this useful info with us. I am in fact pleased to read this weblog posts which includes tons of helpful facts, thanks for providing these kinds of statistics. just anybody get that kind of info in such a perfect way of writing? and wnted to say that I have truly enjoyed surtfing around your blog posts. After all I will be subscribing to your rss feed and I hope you write again ery soon! and now each tim a comment is added I get three e-mails with the same comment.